Head to the boreal forests and mountainous ranges where the Bear reigns as king, in the 40-payline Bear Mountain slot machine. Bears have been a symbol of strength, independence and in the case of the Panda bear, good luck! Here you'll get four of the world's most mesmerizing together in one fantastic slot, thanks to a collaboration between IGT slots and High 5 Games. 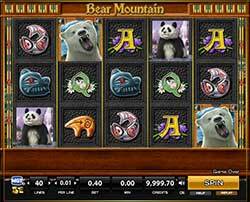 Head to the boreal forests and mountainous ranges where the Bear reigns as king, in the 40-payline Bear Mountain slot machine. Bears have been a symbol of strength, independence and in the case of the Panda bear, good luck! Here you’ll get four of the world’s most mesmerizing together in one fantastic slot, thanks to a collaboration between IGT slots and High 5 Games. The slot casing makes you feel almost like you’re in a cabin in the woods but decorated with stained glass from Frank Lloyd Wright. On the reels you’ll see the four famous bears including grizzlies, pandas, black bears and polar bears, as well as a bear carved totem, orange soapstone bear carving, the Bear Mountain logo, some aboriginal art, and card symbols from Queen through Ace. The game also boast some pretty awesome IGT bonus features including Wilds, Free Spins, and Scatters. Bear Totem Free Spins – The Bear Totem is the trigger symbol for Free Spins. Hit 3, 4 or 5 of these symbols to win 7, 10 or 15 free games respectively! During Free Spins, additional letter symbols are added to the reels that spell out the word B, O, N, U, S. These new symbols are all Scatter symbols exclusive to the Free Spins feature and will award coins even for hitting one of them. If you manage to collect all five during your free games, you’ll initiate the Mountain Multiplier Feature. Mountain Multiplier Feature – During the Free Games, if you collect all letter scatters to spell the word ‘bonus’, at the end of the Free Games you’ll get to select a paw to win a 2x, 3x, 4x, 5x or 10x multiplier. The total free game win is then multiplied by the awarded multiplier to give you an even bigger prize. Bear Mountain Wilds – In this game the game’s logo is the wild. The Bear Mountain logo will substitute for all other symbols except the Bear Totem Scatter symbol to complete winning combinations when possible.